Gilder Lehrman Collection #: GLC00213 Author/Creator: Lincoln, Abraham (1809-1865) Place Written: Washington, D.C. 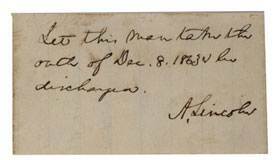 Type: Autograph note signed Date: circa 26 December 1863 Pagination: 1 card ; 4.6 x 8.3 cm. Summary of Content: Lincoln proclaimed a pardon possibility for rebellious soldiers December 8, 1863, in his annual message to Congress. Daniel Linder, son of Usher F. Linder, an old friend of Lincoln in Chicago, was freed on Dec. 26, the date assumed for this document. Background Information: The Oath of December 8th was announced by Lincoln, on that day, in his annual message to Congress in 1863. He would issue a proclamation, he said, offering a pardon to ...any man who would swear without coercion, his allegiance to the Union. The Proclamation of Amnesty and Reconstruction provided a general pardon to soldiers in the Rebellion, and to those, too, who deserted the Union cause. The oath reads in part: "I, [name], solmenly swear, in the presence of Almighty God, that I will henceforth faithfully suport, protect and defend the Constitution of the United States, and the union of the States thereunder; and that I will, in the like manner, abide and faithfully support all acts of Congress passed during the existing rebellion with reference to slaves. . . So help me God."